It was quite and experience but we did make it through the edge of New York City tonight and into the church parking lot at Gateway Christian Center in Valley Stream. The last 30 minutes were pretty hairy. Remind me to tell you about it some time. We parked a few minutes ago. As a reminder, any time you see a bold word on our blog, it is usually a link that you can click. It will usually open in a new tab. On our way to Lowell last week we stopped before exiting the interstate in order to soak up some bandwidth. We had some business to take care of that required internet access and in 2014 we had no internet in Lowell. Thankfully that situation has improved but we had no way of knowing before we arrived. Better safe than sorry. While using the free internet at the rest area on I-91 near Bradford, Vermont we noticed this marker. James Wilson sounds like an interesting man. He was a farmer and a blacksmith with the hobby of astronomy and geography. That seems like a fascinating combination of vocations and hobbies and it made me want to sit down and talk with this guy. It turns out this guy was brilliant. His hobby led him to map making for children and schools and then to making globes. I like globes so that intrigued me even more. As the sign says he learned engraving and soon opened a business making and selling globes. He was the first globe maker in the United States. James Wilson felt like a country bumpkin when he took his first globes to Boston. He had no idea how he would be received but the educated and high society folks in Boston knew brilliance when they saw it. They embraced Mr. Wilson and his globes wholeheartedly and assured him every globe he could make would be sold. His 13" globes were commercially successful at the astronomical sum in that day of $50 each. He opened a second factory and eventually used other materials to make the globes cheap enough for schools and the average home. He made globes the rest of the his life, eventually expanding into building planetariums. 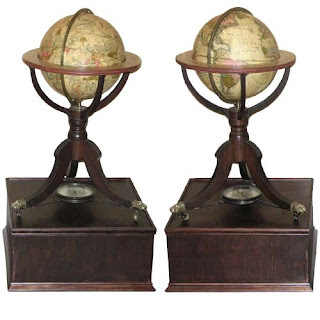 This is a picture of a twin set of terrestrial and celestial globes he made and below that is picture of a globe made by his factory in 1831. Yes, James Wilson was an interesting man and he certainly left his mark in the world. His globes are still fancied by collectors around the world and fetch a hefty price, considerably more than $50. Researching Mr. Wilson led me to THIS. It is a Columbus Imperial Illuminated Floor Globe. It is a 40 inch hand painted globe. I pasted the general description below and you can click on the link for the full description and several more pictures. Designed and Made in Germany. Place Names and Cartography All in English. 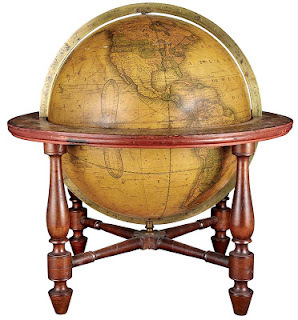 Floor World Globe with American Walnut Cradle and Brass Meridian. Imperial Illuminated Map, 40 Inch Diameter. "The old fashioned map recalls the hand-drawn maps of yesteryear while containing contemporary, up to date geography... In addition to the abundance of place names, this floor globe also contains images of famous sailboats and mythic sea creatures in the style of hand-drawn parchment maps of the past. Despite the classic sensibility of the cartography, you can expect the accurate, detailed and abundant modern geography that Columbus is known for." Now, that is an amazing globe. I did notice that they have them in stock and they offer free shipping to the continental United States. That is generous.